Stanford softball continued to improve during the second week of its 2015 campaign as the host of the Nike Invitational, improving to 7-4 under first year head coach Rachel Hanson, with two victories against top-25 squads. While the Cardinal would suffer a 15-6 loss to No. 3 Alabama (11-1) on Friday night, and a 4-3 loss to Cal Poly (5-5) in the tournament finale, Stanford picked up by far its best win of the season with a 4-1 victory over Alabama, the defending Women’s College World Series runners-up and the 2012 national champions, in a rematch on Saturday morning. Stanford pitchers Madi Schreyer and Haley Snyder turned in key performances in Saturday’s upset over the Crimson Tide, holding a powerful ‘Bama offense to a just one run on seven hits. They held Alabama to 2-for-10 hitting with runners in scoring position and a 4-for-15 mark with runners on base in the game. Finally, Schreyer and Snyder did an outstanding job in avoiding walks, as the Tide drew only four free passes the entire game. The Card’s formula for beating Alabama was certainly a marked change from Stanford’s first win over a top-25 squad, a 10-9 victory over No. 25 Texas in the Kajikawa Classic. While the Cardinal’s pitching and defense were noticeably improved from the offensive slugfest against the Longhorns, Stanford’s offense had to labor to produce runs against senior Crimson Tide pitcher Leslie Jury. After senior outfielder Leah White gave Stanford a 1-0 lead in the bottom of the first, the Card had to rely mostly on small ball to manufacture runs against Jury, as the Cardinal scored a single run in three consecutive innings from the fourth to the sixth. First, senior Hanna Winter drew a walk with the bases loaded in the fourth to give the Card their second lead of the game at 2-1. 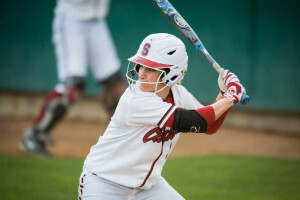 Sophomore Kylie Sorenson recorded a rare extra-base hit against Jury in the fifth to give Stanford a two-run cushion. And with a lead-off single in the sixth, senior Tylyn Wells was able to help Stanford manufacture its final run of the game. Wells was able to take second on a wild pitch by Jury, and then stole third after Tide catcher Chauncey Bell shockingly took her eyes off of Wells as she gathered the ball by the backstop. Lauren Bertoy would then help execute the squeeze play to score Wells and establish the final margin. While the Cardinal were able to win against Alabama on Saturday afternoon despite struggling to hit with runners on base, the Card were not as fortunate against Cal Poly in the Invitational finale. After nearly leading the Mustangs to an upset of the Crimson Tide on Saturday morning, Cal Poly pitcher Sierra Hyland helped her team pull a stunner on Stanford with another pitching gem on Sunday afternoon. Hyland struck out six Cardinal batters and forced 13 popouts on Sunday, as the Mustangs avenged their Friday loss to the Card, which was a 10-2 run rule decision in both teams’ tournament opener. While Stanford was able to get baserunners on against Hyland, particularly in the seventh inning as the Cardinal tried to mount a furious comeback, the Card simply could not convert consistently enough with runners in scoring position, posting a 2-for-12 mark in those situations. Most noticeably, after clawing back to score three runs in the seventh, cutting the deficit to one, Stanford could not complete the comeback, stranding the bases loaded with only one out, as Hyland was able to notch a strikeout and a pop out to second to end the contest. With the Cardinal offense struggling against the Mustangs on Sunday, the Card could not overcome an uncharacteristically off fifth inning from Snyder in relief of the starter Schreyer. Snyder, a freshman from Fair Oaks, California, issued three wild pitches in the top of the fifth, which helped to sustain the Mustang offense in the four-run inning. In the end, a two-RBI single by Cal Poly senior Emily Ceccacci, coupled with an unearned run scored on a Cardinal throwing error, proved costly for Stanford. In the other two games for Stanford, the Cardinal blasted Pacific, 9-5 on Saturday evening, while falling to Alabama 15-6 on Friday evening, all amounting to a 3-2 record at the Nike Invitational. The Cardinal will return to action at home against UC Davis on Wednesday before heading to Cathedral City, California, to participate in the Mary Nutter Collegiate Classic.